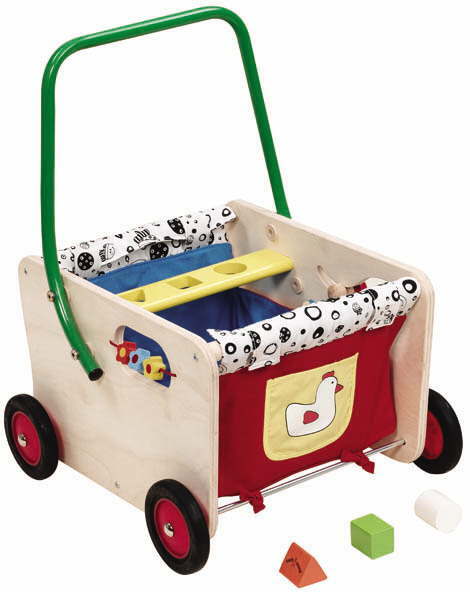 This terrific wooden baby walker trolley not only helps toddlers to walk, but is full of activities, which will keep your child amused for hours. The wooden shapes can be slotted through the sorter, and the child can play with the beads abnd butterflies on the sides or the duck on the handle. It's also great for storage and transporting toys around the house. The stopper can be set allowing the child to gain confidence gradually. The wooden baby walker is lined with padded colourful fabric and will be a delight for any child.